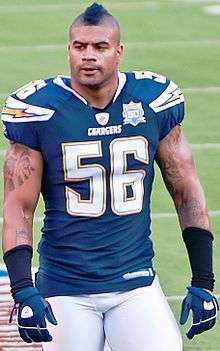 Shawne DeAndre Merriman (born May 25, 1984), nicknamed "Lights Out", is a former American football player who was a linebacker in the National Football League (NFL) from 2005 to 2012. He was among the top linebackers in the NFL in his first three seasons with the San Diego Chargers, where he was a three-time Pro Bowl and All-Pro selection. Merriman was drafted 12th overall by the San Diego Chargers in the 2005 NFL Draft. He earned NFL Defensive Rookie of the Year honors in his first season and recorded 39 1⁄2 quarterback sacks in his first three seasons. He was hampered by injuries his next three seasons, and the Chargers waived Merriman midseason in 2010. He was acquired through waivers by the Buffalo Bills that season, but he only played minimally with the Bills due to continued injuries. He was released by the Bills before the 2012 season before they re-signed him mid-season. Merriman started off his 2005 rookie year on the inactive list and completed a 10-day hold out from training camp. He did not break the starting lineup until week 7, but recorded 6 sacks in his first 4 starts. He was voted into the Pro Bowl as an OLB after playing the position for the San Diego Chargers in their 3-4 defensive scheme which is the same position he played at the University of Maryland. Merriman's best game of the year came in week 15 when the Chargers handed the Indianapolis Colts their first loss of the season. 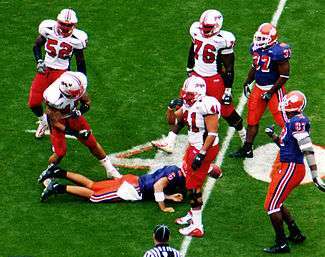 Merriman recorded 2 sacks and 2 tackles for a loss, one of which stopped Peyton Manning for a 6-yard loss on 4th and goal. 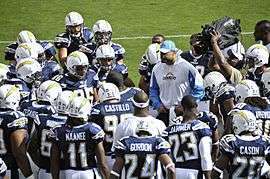 It was during this game that Shawne Merriman garnered much national media coverage and in the following week made the Pro Bowl. On January 4, 2006, Merriman was awarded with The Associated Press Defensive Rookie of the Year award. He received 28 1⁄2 votes of a panel of 50 NFL sportswriters and broadcasters. He beat Seattle Seahawks linebacker Lofa Tatupu, who received 16 1⁄2 votes, Cincinnati linebacker Odell Thurman, with 4, and Dallas linebacker DeMarcus Ware, with one. On February 12, 2006, Merriman participated in the 2006 NFL Pro Bowl in Honolulu, Hawaii. Although in a losing effort, Merriman made 3 tackles and forced one fumble. "I enjoyed myself the whole entire week", said Merriman. "I topped it off today by playing the entire game with all the guys I grew up watching. It's going to be my first of many if I just keep working hard." On October 22, 2006, reports were made public by CNN that Merriman would face a 4-game suspension for violating the NFL's steroid policy. ESPN's Chris Mortensen cited a source that claimed the suspension was "definitely for steroid use and not a 'supplement-type' suspension." Mortenson's report later came under scrutiny from Merriman's attorney, David Cornwell, who called the report "irresponsible and erroneous." Under NFL league policy, no player's suspension proceedings are to be announced before the suspension takes place. Subsequently Cornwell stated that he believed the substance his client tested positive for was the anabolic steroid nandrolone, and that Merriman claimed it must have been in a tainted nutritional supplement he took regularly. Merriman never identified the supplement. At the start of his 2006 season after the 4 game suspension, Merriman again began his season with success, recording 3 sacks and an interception in his first 2 games. Merriman went on to record 8.5 sacks and make ESPN's midseason All-pro team, prior to dropping an appeal against an NFL enforced 4-week suspension due to testing positive for steroids. In the 2006 regular season, Merriman led the league in sacks with 17 while playing only 12 games. He also added 4 forced fumbles to his career (2 against both the Buffalo Bills and the Denver Broncos). Merriman finished third in the balloting for 2006 Associated Press Defensive Player of the Year, behind Jason Taylor and Champ Bailey, after having tested positive for using steroids which is against the league's drug abuse policy. Taylor commented that Merriman should not have been considered for the award because of his suspension. Merriman reportedly responded by sending Taylor a "Lights Out" t-shirt and a box of popcorn with a note saying enjoy watching him in the playoffs. Merriman, nicknamed "Lights Out", performed a dance to celebrate each of his 17 sacks in 2006–2009. After the Chargers were eliminated in the playoffs by the New England Patriots that season, members of the Patriots began performing Merriman's "Lights Out" dance on the field in celebration. Merriman's Chargers teammate LaDainian Tomlinson, referred to the act as showing no class and being disrespectful. On October 13, the Chargers announced that Merriman was being placed on injured reserve and, per NFL rules, would be released when he became healthy. Merriman had re-injured his calf against Oakland and has been limited in the first five weeks of the season. Merriman was put on waivers by the Chargers on November 2, 2010. He had only four sacks in his last three seasons in San Diego. On November 10, Merriman suffered an Achilles injury during his first workout with his new team. Subsequently, on November 27, the Bills placed Merriman on season-ending injury reserve. He signed a two-year contract extension worth $10.5 million with the Bills on January 1, 2011. The deal contained $5 million guaranteed, including $3 million of his 2012 salary. On October 25, 2011, Merriman was placed on Injured Reserve list for the second consecutive season after suffering a partially torn Achilles tendon. Merriman finished the season with nine tackles and a sack in five starts. During the 2012 offseason, Merriman was moved from outside linebacker to defensive end due to the switch of 3-4 to 4-3. On August 20, the team released Merriman. In December 2009, Merriman filed a civil suit against Tequila, alleging intentional interference with contract, unfair competition, and trademark infringement. He claimed that Tequila improperly used his own "Lights Out" logo and disrupted negotiations for T-shirts to be marketed by Wal-Mart. She failed to respond to the suit at all, and a default judgment was entered in his favor for $2 million. However, the default judgment was later set aside in January, 2010. In February, 2010, both sides jointly moved the court to dismiss the claim, and the court dismissed the case on the same day. Merriman is featured in the Nike Football. "Leave Nothing" advertisement. Merriman made a cameo in season 7 of HBO's Entourage. Merriman also appeared on Cartoon Network's Destroy Build Destroy along with Antonio Gates. Merriman appeared on GNC's Athlete Tour 2010 under his MusclePharm sponsorship. Merriman appeared on WGR Sports Radio 550's "Schopp and the Bulldog" in Buffalo, New York on July 27, 2012. He visited the show's studio at Bills' training camp in Rochester, New York. He showed off his tattoos in PETA's "Ink Not Mink" campaign, encouraging people not to wear animals furs. ↑ "Merriman on Pro-Football-Reference". rbref.com. Retrieved 2007-12-20. ↑ "#56 Shawne Merriman". chargers.com. Archived from the original on March 26, 2009. 1 2 3 "Archived copy". Archived from the original on 2013-05-11. Retrieved 2013-06-24. ↑ "Shawne Merriman". Rotoworld.com. 1984-05-25. Retrieved 2010-07-13. ↑ Bell, Jarrett (2005-12-19). "Colts finally taste defeat, begin to regroup". USA Today. ↑ Sources: Chargers' Merriman suspended for steroids ESPN.com. Retrieved 18 July 2007. ↑ Chargers' Merriman appeals suspension Report: Chargers' Merriman appeals suspension Archived November 26, 2006, at the Wayback Machine. Monsters and Critics. Retrieved 18 July 2007. 1 2 3 Mortensen (January 2, 2011). "Bills re-sign LB Shawne Merriman". ESPN.com. Archived from the original on January 3, 2011. ↑ Chargers LB supports the "Merriman Rule"
↑ Chargers LB tested clean 19 of 20 times ESPN. Retrieved 9 September 2007. ↑ 2006 All-Pro Team ESPN.com. Retrieved 18 July 2007. ↑ Larry Brown. "Merriman Brings Back Lights Out Sack Dance". NFL FanHouse. Retrieved 2010-07-13. ↑ Bernie Wilsonassociated Press (2007-12-09). "Lights on again for sackmaster 'Lights Out' Shawne Merriman | Lubbock Online | Lubbock Avalanche-Journal". Lubbock Online. Retrieved 2010-07-13. 1 2 3 4 "Bills release Shawne Merriman". ESPN.com. August 20, 2012. Archived from the original on August 20, 2012. 1 2 Merriman wants to remain a Bolt, January 29, 2010, San Diego Union-Tribune. ↑ "Chargers lose Merriman". Chargers.com. 2010-10-13. Retrieved 2012-08-20. ↑ "Buffalo Bills claim LB Shawne Merriman off waivers - ESPN". Sports.espn.go.com. 2010-11-04. Retrieved 2012-08-20. ↑ Graham, Tim. "Shawne Merriman hurt in first Bills workout - AFC East Blog - ESPN". Espn.go.com. Retrieved 2012-08-20. ↑ "Buffalo Bills put Shawne Merriman on IR - ESPN". Sports.espn.go.com. 2010-11-27. Retrieved 2012-08-20. ↑ "Shawne Merriman of Buffalo Bills put on IR with Achilles injury - ESPN". Espn.go.com. 2011-10-25. Retrieved 2012-08-20. ↑ "Shawne Merriman released by Bills after one season". NFL.com. Retrieved 2012-08-20. ↑ "Merriman returns to Bills". buffalobills.com. 15 October 2012. Retrieved 23 March 2015. ↑ "Shawne Merriman announces retirement from football". NFL.com. ↑ "Shawne Merriman Stats". ESPN Internet Ventures. Retrieved 17 March 2014. ↑ Gustafson, Craig (2009-09-06). "Chargers' Merriman arrested; celeb alleges battery". SignOnSanDiego.com. Retrieved 2010-07-13. ↑ "NFL's Merriman arrested, accused of choking Tila Tequila". CNN.com. 6 September 2009. Retrieved 6 September 2009. ↑ Wilson, Bernie (September 11, 2009). "DA dismisses case against Merriman". Associated Press. Retrieved 2009-09-12. ↑ Order Setting Aside Default, Lights Out Holdings, LLC v. Nguyen, No. 09-CV-2742 H (CAB) (S.D. Cal. Jan. 27, 2010). ↑ 'Order Granting Joint Motion to Dismiss, Lights Out Holdings, LLC v. Nguyen, No. 09-CV-2742 H (CAB) (S.D. Cal. Feb. 16, 2010). ↑ "Archived copy". Archived from the original on 2008-07-01. Retrieved 2007-10-14. Easports.com Accessed October 10, 2007. ↑ "Buffalo Bills DE Shawne Merriman Shows Off His Tattoos To Team Up with PETA in New Ad Campaign," Associated Press, 3 January 2013. ↑ "WWE News: WrestleMania 30 pre-show guest signed to WWE contract". ProWrestling.Net. 2014-04-09. Retrieved 2014-04-09. ↑ "Shawne Merriman Done With WWE". OvertimeNation.com. 2014-08-27. Retrieved 2014-08-27.